Plus, below-par Liverpool lucky to escape with point. FAR TOO OFTEN, the brilliance of Paul Pogba is overshadowed by his critics’ constant focus on mundane and trivial aspects of his lifestyle, as opposed to his actual performances on the field of play. Even before kick-off ahead of Saturday’s crunch derby, a large portion of the build-up honed in on the colour of the player’s hair (blue) matching the colour of his opponents’ shirts, just days after Pep Guardiola claimed he was offered the chance to buy the player from superagent Mino Raiola. If it isn’t his hair colour, his dancing, celebrations, use of social media, style of clothes, or taste in music is put under the spotlight and used as a stick to beat him. It is true that Pogba has failed to live up to his price tag this season and in a year where Manchester City have cantered to the title, his lack of big performances in important games has been a cause of frustration. Reasons for his poor performances are multi-faceted, from reported discontent with boss Jose Mourinho, to being played too deep in midfield to get the best out of his creative talents, to a lack of consistency both as an individual and in relation to his team-mates. Pogba’s role as a creative player can often make it seem like he is being lazy or not caring through a lack of constant running, but Lionel Messi is not faced with the same criticism when he jogs lightly throughout games for Barcelona, only to burst into action suddenly. 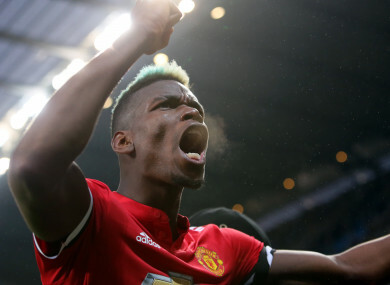 Saturday’s 3-2 win against City was a moment of reckoning for Pogba, not only because he turned the game on its head to spoil his opponents’ crowning moment, but because he finally delivered on the big stage when the chips were down and he needed to be counted. With his two goals, he showed a poacher’s instinct, but also demonstrated a resilient mentality to constantly better himself in the pursuit of proving his critics wrong, silencing them just like he did tens of thousands of supporters inside the Etihad on Saturday. His hair colour suddenly seems irrelevant, with only Pep Guardiola and City’s deflated supporters feeling blue in the wake of his brace that inspired United to victory. Saturday was supposed to be a day of happiness, celebration and joy for Manchester City and their supporters. Seven days ago, following their win against Everton, what they had hoped for so many weeks was close to being realised: that they could officially claim the title against the rivals whose shadow they had been living in for decades until relatively recently. With Sir Alex Ferguson watching on from the stands of the Etihad, Pep Guardiola’s side took Manchester United to pieces, racing into a 2-0 lead at half-time, when it so easily could have been double that. However, their dream quickly turned into a nightmare, thanks to a double from Paul Pogba and Chris Smalling’s winner, with a game of two halves swinging firmly against them. Whereas two months ago, suggestions were floated that City could potentially win a quadruple, now the side have been denied not only the FA Cup and potentially the Champions League too, but the champions-elect have also been denied the perfect crowning moment, which they had dreamt about in the Premier League. From start to finish this season, City have been the standout team in the English top flight. With their FA Cup exit, 3-0 Champions League spanking at the hands of Liverpool (who were 20 points behind them in the league standings at the time), and now a 3-2 shock at the hands of Jose Mourinho, their season of glory is beginning to lose some of its shimmer and gloss. In the wake of Saturday’s defeat, throwing away a 2-0 lead and their chance to win the league against their rivals away, City will have plenty of food for thought. It should make no significant difference: champions are forged throughout the season and not just in the final few weeks; but the fact that those big days of joyous celebration like Saturday have been thrown away means Manchester City will leave some regrets behind in a season of regular highs. They will win the league as one of the Premier League’s greatest ever champions, but City will still ponder what could have been if not for these uncharacteristic late slip-ups. Harry Kane garnered most of the pre-match headlines, as the England international made his first start since picking up an injury in Spurs’ win over Bournemouth last month. But it was Christian Eriksen that was the player being talked about afterwards, as his brace saw Tottenham edge Stoke to go level on points with third-place Liverpool with a game in hand (although it should be pointed out that Kane claims he got the final touch for Eriksen’s second). People have rightly pointed out the importance of Kane to Spurs and speculated about how problematic a situation they would find themselves in should the 24-year-old striker ever opt to leave the club. But Eriksen has proven to be equally invaluable since joining the London side from Ajax for what now looks a serious bargain, £11 million, in August 2013. So far this season, Eriksen has eight assists (per ESPN). For the previous two seasons, he finished second in terms of overall Premier League assists. He now has 10 top-flight goals (with 17 in all competitions) and needs just one more to beat his best-ever tally in a single campaign. Without their great Dane, it seems fair to assume that Tottenham would not be up there with Liverpool and United challenging for second place or have enjoyed anything like the success they have achieved in recent seasons. It was always asking a lot for Liverpool to match the midweek heights of their Champions League triumph against Man City. Given that they did not have much time to recover from Wednesday’s heroics, it was no surprise to see their performance levels dip considerably for Saturday’s 0-0 draw with Everton at Goodison Park. In general, it was a subdued game by Merseyside Derby standards, with Everton belatedly coming alive in the second half and coming close to grabbing a winner on more than one occasion near the end. Jurgen Klopp made five changes from the Man City win, and chose not to risk free-scoring Mo Salah, after the Egypt international’s recent injury. From a Liverpool perspective, the game felt like a bit of a phoney war ahead of their crucial second-leg encounter with City, and the match’s recurring tepidness was epitomised by the fact that it was only the second Merseyside derby in Premier League history without a single card shown. After an eight-game losing streak, Saturday’s 1-1 draw against Swansea at the Hawthorns will at least feel like a step in the right direction for beleaguered West Brom. It could have been so much better, however, but after Jay Rodriguez’s second-half goal, a Tammy Abraham header 15 minutes from time ensured the visitors departed with a point. The Baggies consequently need a miracle to survive, as they sit 10 points from safety with five games remaining. Nevertheless, caretaker boss Darren Moore — who has taken over following the recent sacking of Alan Pardew — was remaining positive after seeing his team produce a battling display. “I’m really delighted even though we couldn’t hang on for the win,” he told the BBC afterwards. “I’ve had three days to work with them and I thought the players were first class. Email “Paul Pogba comes good and more Premier League talking points”. Feedback on “Paul Pogba comes good and more Premier League talking points”.